Ok, so polynyas aren’t exactly crop circles, but they are open water areas in the Artic where you would normally find ice. You might think that it’s weird that I am just talking about holes in the ice, but the underlying physical processes keeping these holes open is fascinating, and they are biologically important. There are 2 types of polynyas that you should know about: Sensible heat (or Open-Ocean) polynyas and Latent-heat (or Coastal) polynyas. Really, they are categorized based on how ice is removed from the system. Sensible-heat polynyas occur similarly to what drives osmosis: a concentration gradient. But unlike osmosis, sensible heat polynyas are driven by a temperature gradient. When two bodies of water are different temperatures, heat is transferred from the hotter body of water to the colder body. These sensible-heat polynyas occur when water is above freezing and upwells, heat from the warmer water melts the ice, and BOOM you have yourself a polynya. No aliens required. Latent-heat polynyas are mechanically driven, meaning they form due to prevailing winds and currents. Latent-heat polynyas are different because ice is still produced within the polynya. This is because water inside the polynya is still at or below freezing. Instead of heat melting the ice, latent-heat polynyas simply export the ice that is produced by winds or currents. It is important to note, heat is still lost across the air-sea interface. Like most of the world, polynya categories are not black and white. Some polynyas are heavily controlled by temperature, but occasionally by wind; some are controlled by wind, but occasionally by temperature; and sometimes you get a 50/50 combination. So now that you have a basic understanding on what processes form polynyas, where do they occur? Polynyas aren’t random features, and there are areas where they are more likely to occur. They have fixed geographical locations at specific times of the year. Latent-heat polynyas generally occur next to coasts. Here, offshore winds or coastal currents are the ice transporting mechanisms. Sensible-heat polynyas are associated with regions of upwelling, or strong vertical mixing. Things like tidal activity in restricted areas, and interactions of water bodies and bathymetry (high areas like seamounts) can cause mixing. This is why sensible-heat polynyas can occur in the open ocean. Polynyas are really important for ocean circulation. When ice forms in the ocean, it expels the salt. This is known as brine rejection. Brine rejection is important because salt is heavy. 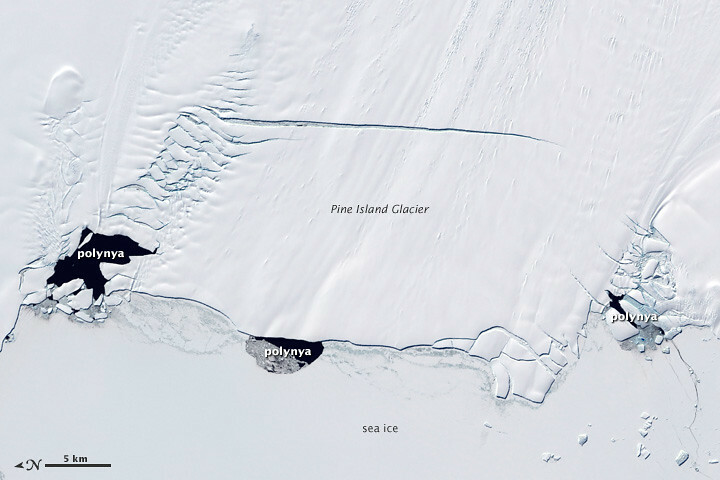 When more ice forms, more salt gets rejected, which leads to heavier water, heavier water sinks and forms bottom waters (very cold, salty, dense water). Ultimately this water is part of thermo-hyaline circulation, or the Great Ocean Conveyor belt. Thermo-hyaline circulation helps move the world’s surface waters down to the ocean floor, around the world again, and back up to the surface. 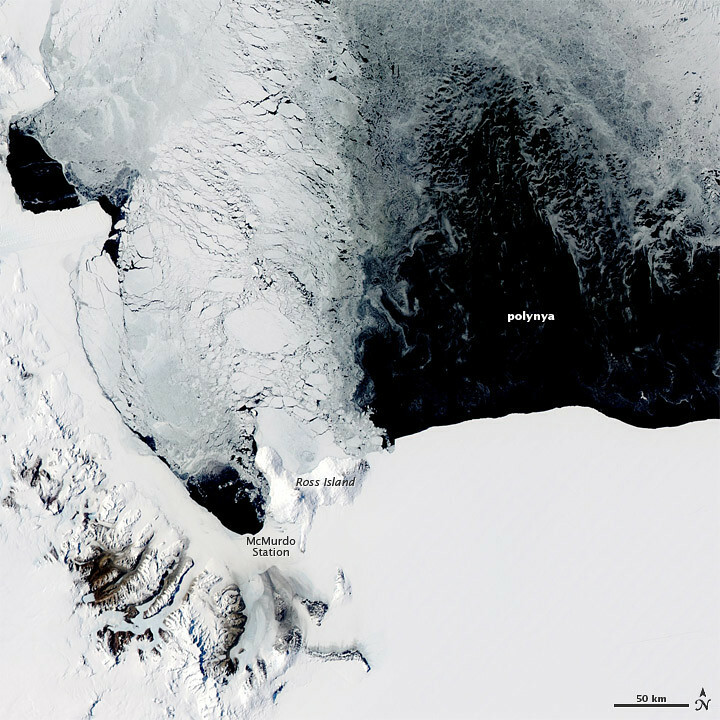 Not all of the ocean’s bottom water is formed in polynyas, but the Cape Darnley polynya accounts for 6-13% of the total Antarctic Bottom Water formed and that’s just one polynya. I would like to note, that I am leaving out a lot, like seasonality (sorry physical oceanographers). The Great Ocean Conveyor belt. From here. Polynyas are windows into the ocean. Sunlight is able to penetrate the surface water so phytoplankton can bloom. When phytoplankton bloom they attract a suite of organisms. Copepods feed on the phytoplankton, little fish eat the copepods, big fish eat little fish, and somewhere down the line you end up with sharks (sorry microbiologist and ecologists, I missed a few steps). Polynyas are openings at the poles where air and water can finally interact. This leads to things like CO2, heat, and moisture exchange. All of which are important for precipitation, ice cover, and the carbon cycle. Polynyas are also used for navigation by sea creatures, like narwhals (stay tuned…I might just write about sea unicorns). Narwhals, walruses (although, I wish the plural of walrus was walri), and other whales use polynyas for air when they move throughout the arctic. Maybe they really are crop circles, and we should be investigating aliens as the culprits.